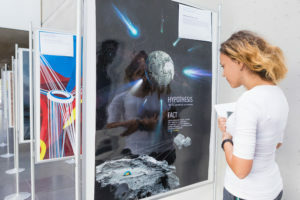 On 4th of October at the Technical University of Dresden the unique poster exhibition “50 Inventions Bestowed by Ukraine to the World” has been opened to interested academics and the general public. It has been organized by the German-Ukrainian Academic Society within the framework of its second annual meeting. Copyright: Jürgen Lösel/ Deutsch-Ukrainische Akademische Gesellschaft e.V. There is hardly anybody who is not using WhatsApp nowadays or have not heard about The Big Bang theory, but what they have to do with Ukraine? Professional artists and illustrators of the Direct96 creative group followed the footsteps of Ukrainian inventors, carefully studied their work and created 50 artworks highlighting the outstanding discoveries and inventions that arose from ingenuity of the researchers and engineers, surgeons and explorers of Ukraine. At the opening ceremony Dr Iryna Tybinka, Minister-Counsellor of the Embassy of Ukraine in the Federal Republic of Germany, has officially launched the exhibition, noting: “It is important that we raise awareness of the public and show how many noteworthy contributions Ukraine has made to humanity. In fact, it is very fitting that this exhibition was organized by the German-Ukrainian Academic Society, because who else but the researchers themselves can better appreciate the discoveries and then spread the message further”. The opening ceremony organized was attended by prominent guests, including Dr Ronald Werner, Head of the Department of Higher Education Institutions at the Saxon State Ministry for Higher Education, Research and the Arts and Professor Bernd Büchner, Scientific Director of the Leibniz Institute for Solid State and Materials Research (IFW Dresden), as well as by interested academic and general public. The Leibniz Institute for Solid State and Materials Research in Dresden (IFW Dresden), Helmholtzstraße 20, 01069 Dresden. If you cannot visit the exhibition in person, but interested to learn more both about the art and the science behind it, please visit the web-site of the Second Floor Art Center in Kyiv to view the art and read the brief descriptive summaries of the corresponding inventions and discoveries, covered by the exhibition. The exhibition materials were provided by The Ukraine Crisis Media Center and The Embassy of Ukraine in the Federal Republic of Germany sponsored the organization, and funded the translation and publishing of the accompanying book (German/ Ukrainian), which was presented at the launch event as well. The German-Ukrainian Academic Society is especially grateful to the Extraordinary and Plenipotentiary Ambassador Dr Andriy Melnyk and the Embassy of Ukraine in the Federal Republic of Germany for facilitating and sponsoring the organization of this exhibition, to Professor Gianaurelio Cuniberti, the Chair of Materials Science and Nanotechnology, TU Dresden and Professor Bernd Büchner, Scientific Director of the IFW Dresden, for their immense help in organization of this exhibition and their active support of German-Ukrainian cooperation.